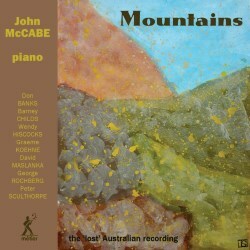 John McCabe (1939-2015) needs no introduction, either as a composer or as a pianist. For example, his recording of the Haydn Sonatas (1975) remains definitive. He was always an enthusiastic supporter of 20th century British composers as well as a promoter of several contemporary composers. In 1985 McCabe visited the EMI studios in Sydney Australia to make an album of works by American and Australian composers. The project was ‘put to one side’, the studios closed, and it was presumed that all the masters were lost. Last year a cassette (remember them?) copy of the performance was discovered and subsequently remastered and digitalised. It has now been released on CD. The opening piece on this fascinating CD is Peter Sculthorpe’s ‘Mountains.’ The work was written in 1981 and was inspired by the landscape of the composer’s native Tasmania, which has been referred to (apparently) as ‘The Isle of Mountains’. The work is in ternary form with huge dramatic gestures framing a passionate and ‘ecstatic’ ‘trio.’ I feel that the music does achieve its aim of suggesting the grandeur and majesty of the mountains, although I did find some of the repetitive harmonies just a little wearing. Wendy Hiscocks was born in Wollongong in New South Wales and subsequently studied with Peter Sculthorpe at Sydney University in the early 1980s. Her Toccata is influenced by Indian ragas and an intense concentration on melody and rhythm. It is highly charged with an insistent structural reference to the note of Bb. The notable feature of David Maslanka’s ‘Piano Song’ is the sheer simplicity of the harmonic and melodic material. By simple, I do not imply easy or uninteresting. The composer, who was a native of Massachusetts, has suggested that the music portrays ‘the cumulative unhurried atunement (sic) to the New Hampshire summer’. The more dramatic central section may well suggest ‘all the live murmur of a summer’s day.’ ‘Piano Song’ was composed in 1978 at the beautiful MacDowell Colony in Peterborough, New Hampshire. Don Banks is a composer who has been largely ignored by the record industry. He is probably most often recalled for his excellent Violin Concerto (1968) which was released by Lyrita. Born in Australia, Banks came to London to study with emigré composer Mátyás Seiber and later went to Florence to work with Luigi Dallapiccola. Certainly, the influence of the latter is clear in his ‘Pezzo Dramatico’ for piano solo. A tone row does seem to underly this ‘dramatic’ piece, but like his teachers, he bends it to his own convenience. There are hints of jazz here too. The work is in a single tripartite movement – two highly intense sections frame an ‘elegiac’ middle section. I loved Graeme Koehne’s impressionistic ‘Twilight Rain’. The liner notes declare that the composer is attempting to ‘reconcile a modernist style with poetic intentions.’ Many of the harmonies and melodic flights are influenced by Debussy’s two books of ‘Preludes’. There is also a nod to the complex works of Kaikhosru Sorabji. The title will help the listener enjoy this piece, although there is an obvious watery feel to this music. Graeme Koehne is an Australian composer, born in Adelaide. He has developed a ‘crossover’ style absorbing pop, rock and jazz. He divides his career between composing and academia and is currently Head of Composition at the Elder Conservatorium of Music. American composer George Rochberg’s massive ‘Carnival Music’ is the longest work on this CD. It is the only piano work by Rochberg to make use of ‘popular’ musical tropes. Yet, this is hardly surprising as the composer worked in a New Jersey bar as a pianist during the 1930s. The opening ‘Fanfares and March’ deploys aggressive chords balanced against a swingy little tune. It surely nods towards music of the circus. More obviously ‘pop’ is the ‘Blues’ movement that is pure pastiche. The thoughtful ‘largo doloroso’ is the heart of the work. It is chromatic music that reflects deeply-felt harmonies and has been likened to a Bach arioso. This is followed by a ‘Sfumato’. Rochberg has hinted at the background to this piece: ‘Sfumato’ is ‘a style of painting during the Renaissance in which figures, shapes, objects emerged out of misty, veiled, dreamy backgrounds.’ The final movement, ‘Toccata-Rag’ once again revisits the composer’s past career as a bar pianist. This is less of a parody than the ‘Blues’ movement: at least until the second half when the ‘ragtime’ is really and truly in your face, albeit with a modernist tinge. ‘Carnival’ is a splendid work that moves away from Rochberg’s normal atonal world and deploys a greater sense of tonality, along with allusions to past masters and American popular music. The final track is American composer Barney Child’s evocative ‘Heaven to clear when day did close’. Enthusiasts of the Elizabethan poet Ben Jonson will recognise the title as coming from his Hymn to Hesperus. The music was composed in 1980 and is dedicated to John McCabe and fellow pianist Dianna Thomas. The central section would seem to be written in ‘jazz-direction’ style after which the music moves to a dreamlike conclusion. The overall impression is one of concentrated luminosity reflecting the light and brightness of Jonson’s lyric. The liner notes provide a discussion of this lost recording, give succinct notes on each piece and a brief biography of the soloist. There are several photographs of John McCabe. The remastering is perfect. I would never have imagined that it came from a Dolby cassette. John McCabe’s wonderful performances of these works needs no advocate. He brings his usual technical skill, musicianship and immense understanding to all these diverse and ultimately approachable works.